I am so honored that she invited me to blog today. This week is bringing many blessings. I've lined up two book signings, both on Long Island, and I have my new book marks ready to be laminated. I also won a contest at my writers group, Absolute Write, for a non-fiction piece. I'm a spiritual being having human experiences. My greatest works--so to speak--are my three outstanding sons. 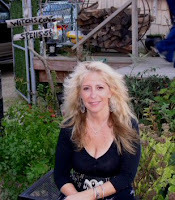 Creatively, I'm a writer of paranormal fiction and long-time practicing astrologer and psychic medium. I've been blessed by notable teachers including author Trish Telesco, Jamie Samms, author and creator of Medicine Cards, and the late Robert ‘Buz’ Myers, internationally respected astrologer. Currently, I'm a Reiki practitioner and Priestess as well as an artist with my work sold in local shops and the internet. My new novel is out now and can be purchased at http://www.mybookstoreandmore.com. It will be out in hard copy October 16. An art lover since--forever, when I'm not writing, I paint fantasy/Goddess art on glassware,wood, basically anything that sparks my imagination.